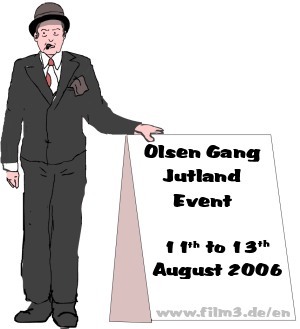 English: - "The Olsen Gang in Jutland"
German: - "Die Olsenbande fährt nach Jütland"
Danish: - "Olsen-Banden i Jylland"
From 11th to 13th August 2006 will the big "Olsen Gang Jutland Event" take place in Denmark. It will be fun for the whole family. The unveiling of the new silhouette, bigbands will play the Olsen Gang theme and you can visit film locations. Morten Grunwald (alias Benny), Bo Christensen (producer of all Olsen-Banden films), Lotte Dandanell (costume designer), John Lindskog (writer of the Danish book "Skide Godt, Egon!") and Frank Eberlein (writer of the German fan book and the lexicon about the Olsen Gang) confirmed their attendance. The whole area Thy will be changed into Olsen-Gang-area. The centrum of the events will be the city Thisted in the north-west Denmark. In the market square will the Olsen Gang showed as a play, in the museum will be an Olsen Gang exhibition, of course the cinema 1-2-3 will show the film "The Olsen Gang in Jutland" (in Danish and German) and across the whole city will be a big treasure-seeking. You will get more details from the program. - 35 years "The Olsen Gang in Jutland"
Of course you have not to miss a pilsner, the Thisted Bryghus produce a Olsen Gang-beer! Tickets for "The Olsen Gang in Jutland" (Danish and German) with intros from Olsenbandenfanclub Deutschland and John Lindskog you can order now on www.kino1-3.dk or phone +45 97923399.